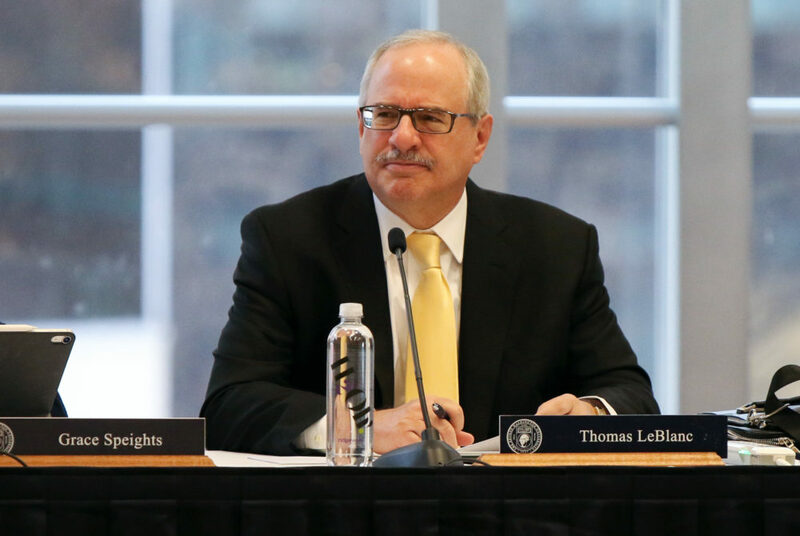 University President Thomas LeBlanc announced during a Board of Trustees meeting Friday that the University will unveil its next capital campaign during Colonials Weekend in 2021. The University’s next major fundraising campaign will kick off in 2021 as GW celebrates its 200th birthday, officials said. University President Thomas LeBlanc announced during a Board of Trustees meeting Friday morning that the University will unveil its next capital campaign during Colonials Weekend in 2021. That weekend will wrap up months of events celebrating GW’s bicentennial, which will begin Feb. 9, 2021. He said in an interview Friday that the campaign is still contingent upon the approval of the Board of Trustees. The University’s last fundraising campaign wrapped up in 2017 after officials hit their $1 billion target a year ahead of schedule. The campaign’s donations included major gifts from billionaire philanthropist Michael Milken and Sumner Redstone, whose contributions to a public health scholarship totaled $80 million during the campaign. Fundraising officials have been preparing for the University’s next campaign since the $1 billion effort concluded. Administrators, led by new Vice President for Development and Alumni Relations Donna Arbide, created new goals last fall to increase the size of GW’s donor base ahead of the next major campaign. The targets include hitting 16,000 alumni donors this fiscal year, keeping 64 percent of all donors annually and requiring each staff member in the development office to visit 150 donors each year. The efforts in part aim to combat GW’s historically low alumni giving rate of roughly 9 percent. The Board of Trustees also created a task force two years ago that has also discussed the steps necessary to launch another campaign.